Let me be honest about it. As a young girl who’s spent most of her summer vacations on the highway tagging along with her traveler parents, I understand what this means. No Mummy. Let’s wait for some more time… we might just spot a petrol pump nearby. Sometimes, we did. But not every time have we been lucky. Driving across long barren Indian national highways through small archaic villages, with vast jungle lands stretching into infinity and no life in sight, the basic action of answering nature’s call has not always been easy. Occasions like these have been rare but not totally non existent. As much as these have been embarrassing, in a way I am also thankful for them. For someone who's lived in the suburbs of Mumbai all her life, enjoying the basic comforts in life (and more), instances like these have been nothing less than an eye opener. For they have inspired me in a certain way, and empathized me in a way I am not sure if anything otherwise would have. 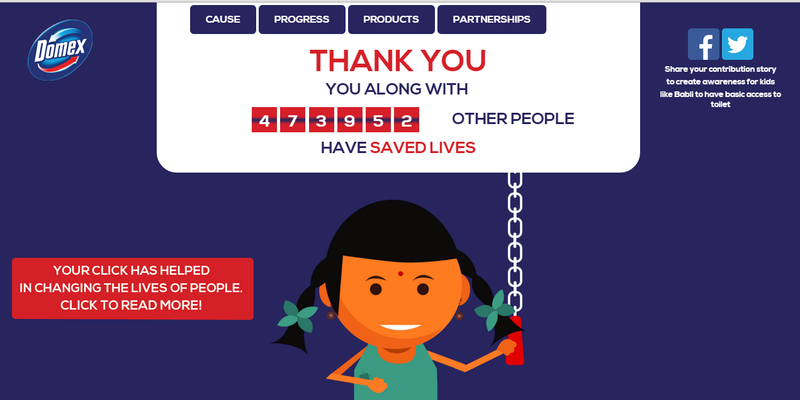 Today, I am only glad because I understand and can completely relate to a campaign like #ToiletForBabli. Babli is a young village girl who is forced to walk out in the open everyday in the company of the night, not to gaze at the moon or the stars, but to perform a very basic activity, a necessity of life – of reliving oneself. While the misery of travellers like me is still short lived, it is heart wrenching to think that of Babli's is permanent. What's even more shattering is the shocking reality that Babli is not alone. According to a survey by the World Bank, over 600 million people, roughly 60% of Indian households, still have to head to the fields or other open spaces to use them as makeshift bathrooms. Clearly, lack of proper sanitation and shortage of basic bathroom facilities is a major crisis throbbing in India. Not surprisingly, it is girls and women, being the more vulnerable of the two sexes, who pay the heavier price. Venturing out in the dark for defecation exposes them to the risk of horrific, even deadly, attacks of sexual violence like molestation, rapes and verbal and physical abuse. That apart, not being able to access toilets raises threats on health and hygiene leading to a variety of serious infections and ailments impacting the overall health of not just the womenfolk but the entire family and nation dependent on them. What’s saddening to assimilate is the fact that it’s not a one day ordeal but a trauma that they have to face each and every morning of their life. Just imagine. My heart shatters into pieces just by imagining the shame, indignity and embarrassment they have to bear. Simply put: it’s totally cruel, brutal even life threatening to not have the privacy to perform a necessary bodily function. In a grim situation like this, what rings hope are awareness campaigns like the recent Domex intitated #ToiletForBabli. Those days when issues like these were spoken in hushed tones and better preferred to be swept under the carpet are now passé. It’s inspiring and energizing to see such a sensitive issue of eradicating open defecation addressed in innovative ways that could not even be imagined a decade ago when the word 'toilet' was still a taboo, forget speaking about it. The country’s Prime minister Narendra Modi addressed the cause of proper sanitation in an epoch Independence day speech where he resolved to put ‘toilets before temples’ and urged every citizen to get together for the cause. Not to forget, real heroes like a 5th grade dropout Savita, who took the bold step of walking out of her 7 year old marriage as her husband was not ready to have a permanent toilet at their house in Mundlana village in Madhya Pradesh. Savita was still a woman… think of all the Bablis out there. Simple young village girls filled with big dreams in their small round eyes. All they want for now is to lead a healthy, hygienic, dignified life. To accomplish this, they are here along with Domex seeking your help and mine. Together, we can bring about a change in the lives of millions of kids, thereby showing our support for the Initiative "You Click, Domex Contributes" at www.domex.in. All we need to do is “click” on the “Contribute Tab” on www.domex.in and Domex will contribute Rs.5 on our behalf to eradicate open defecation, thereby helping kids like Babli live a dignified life. I just clicked! Will you also join in and help Babli lead a dignified life? Just a click. And, Babli's face beams up, instantly. I saw it. You can see it too. It’s a glow that shall light up your soul. As I was reading you, facing the same issues while traveling I could relate to it. Clicking it right away!!! Great initiative , I some time wonder how difficult is to build toilets for a nation that sends mission to mars ? Complaining about lack of facilities we rarely stop to think how lucky we actually are. Hey Arti. loved the write up... its honest and genuine .. loved the personal touch .. Thanks for addressing such an important and overlooked issue. I support you! Is it that bad here? Didn't expect that at all. True, this issue needs a focused approach and a firm resolve to tackle. This was heartbreaking to read. Thank you for bringing this to our attention, Arti. It really is sad to know that some things we take for granted is a blessing to someone else. I hope this makes enough of a difference in these kids' lives. Had seen this on Twitter, Arti & clicked & shared & supported on World Toilet Day. May we have toilets for all soon. While travelling, the biggest issue I face is the toilet issue. I have a very frequent urination problem and for this it has become a serious issue for me when I travel. Nice contribution to the cause and well written from the perspective of women. We need to address the issue, though villages has improved much better the supersaturation to not have bathrooms inside homes still exits. This was really sad reading and really hope that a difference can be made. What we take for granted, must be so hard for those that do not have sanitation in their homes.